A strong commitment to the architectural profession. Jessica Reinert’s hard work is not going unnoticed. Reinert, executive director of the American Institute of Architects (AIA), Iowa Chapter, recently received two awards for her significant contributions to the field of architecture. In August, she became the first-ever recipient of the Emerging Executive Award. Reinert was chosen by leaders of the AIA for her outstanding leadership qualities and unparalleled commitment to her AIA chapter. The award also recognizes an individual’s commitment to the design and construction industry, and the local community. In September, Reinert received a 2014 AIA Iowa Honorary Membership for her distinguished service to the profession of architecture in Iowa. What does AIA Iowa do? We’re a professional association with a mission to improve the built environment through service to members, the profession, and the public. AIA Iowa provides representation for the profession on legislative issues and professional development to help our members not only receive the education they need to uphold their license, but also to make Iowa a better place. Members also increase their leadership skills by participating on committees and sitting on our board. What are AIA Iowa membership benefits? There are several benefits of being a member of the American Institute of Architects, whether you are a registered architect, an “emerging professional” (someone who has not yet passed the Architect Registration Examination), or a company related to the profession. Members have many opportunities to grow and utilize their leadership skills, as well as to connect with others related to the profession. They are also offered several discounts on AIA contract documents, AIA Iowa professional development events, and more. 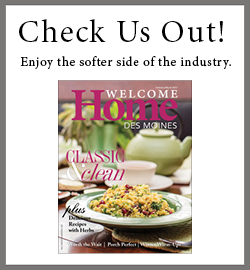 And members receive our print and email publications, including Iowa Architect magazine and our newsletters. Members and nonmembers alike receive representation of the profession though our advocacy and government affairs programs. What are your duties as executive director? I work with the board of directors, committee chairs, and committee members, and run the organization’s day-to-day operations. That includes managing the budget and staff, overseeing various events and activities, and carrying out the board’s direction for the organization. What has your involvement been with AIA Iowa? I have worked with AIA Iowa since 2003. I began as director of communications, working my way up to deputy director, then interim executive director. I became executive director in 2012. What goals do you have for the organization? My goals for the organization are to energize our membership across the state and to communicate the value of architecture to all of Iowa—not only our members, but the public. For our chapter, it’s to become a leader in advocacy for the built environment and for those who live, work, play, and worship in the buildings that our members design. Describe the major challenges facing architects. The challenges include sustaining a business environment where the building owner and users of the building are fairly represented throughout the design and construction process of a project. Another challenge is related to an uptick in work within the profession, where we are dealing with a shortage of professionals skilled in architecture and design. What changes do you foresee in the field? I see a shift toward sustainability becoming the norm. I believe in a few years, that will be the way people do business. It’s something architects have always done but not necessarily been requested by building owners or clients. Meeting the demands of sustainability’s growing popularity has been an easy transition for architects because a lot of them were thinking and doing it before it was “cool.” The profession as a whole has always been a big believer in sustainability. What accomplishments are you most proud of in your time with AIA Iowa? One accomplishment I am most proud of is the creation of our secondary website, IowaArchitecture.org, which we just completed. It showcases award-winning and published architecture by Iowa architects, within and outside of Iowa. It’s one of our latest efforts through technology that advocate for the outstanding design that our members create in Iowa. During the 2014 legislative session, we passed a Good Samaritan bill for architects. We’ve had a number of members that have come to aid in disasters, helping to deem a building safe for habitability. In the past, they’ve been personally liable when they volunteer. This legislation now allows them to work with the State to identify the situations when they’re needed and to provide assistance without personal liability. In addition, I’m proud to be part of a culture of professionals that give back to their communities, look toward the future and long-term benefits of quality of design within our state, and are committed to protecting the health, safety, and welfare of Iowans. I’m a member of the Des Moines Rotary Club, which has been very rewarding. I’m also an active member of the Iowa Society of Association Executives, and on the board of the Iowa Architectural Foundation. In addition, I’m involved with a women’s group called P.E.O. (Philanthropic Educational Organization) International, and am a member of the parent teacher organization at my son’s school. I live in Story City with my husband, Gene, and our two sons, Joseph, 6, and Jaden, 3. I like spending time with my family outdoors, gardening, bike riding, and watching both my sons’ sports activities.